It’s been two months since Tim Urban updated Wait But Why, his last post being a mea culpa of sorts for not being sufficiently aware of his ‘white male privilege’. Either he’s working on another epic post or he’s still shell-shocked from the backlash wrought by his last two posts. 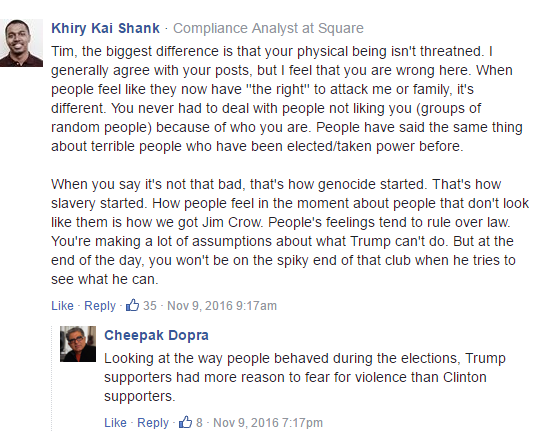 He was right…there were incidents of racism and violence following Trump’s win–against white Trump supporters perpetrated by blacks. Of course, we can’t let such details get in the way of a narrative that Trump voters are literally the KKK. But anyway, Tim’s biggest mistake was believing that liberals would respond to facts, logic, and reason–but that’s not how far-left liberalism works–it never has and never will. Far-left liberals care about winning and ideological purity, above all else. Like a cancer, virus, zerglings, or termites, they are ruthless and single-minded and will stop at nothing in their pursuit of power and control, destroying their host in the process if need be. You think you are in control, but one wrong move and it’s over, like a tiger turning against his hapless trainer. Cancer dies when it’s deprived of glucose. Likewise, the way you defeat SJW-liberalism is to starve it of the attention and chaos it seeks–ignore their pleads for you to check your privilege. They want your contrition–never capitulate and give it to them. First, it won’t work: it’s too late. The scarlet letter is irrevocable. Second, by caving in, you’re only emboldening them. Third, you’re not alone: the rest of the internet (such as Reddit and 4chan), including even other liberals (as the example above shows, being a liberal does NOT make one immune to the SJW piety mob–not by any stretch of the imagination), hate the SJW-left, so you have many allies that you can turn to for support. Fourth, of course, is that being a white heterosexual male is nothing to apologize about.